When it comes to horror movies, perhaps the only actors as identified with the genre as Vincent Price are Boris Karloff and Bela Lugosi themselves. There is good reason for this, as Mr. Price starred in many of the classics of the genre, including The Invisible Man Returns (1940), House of Wax (1953), The Fly (1958), House on Haunted Hill (1958), The Masque of the Red Death (1964), and The Abominable Dr. Phibes (1970). It must be kept in mind, however, that while Vincent Price is best known for his horror movies, he did so much more. Indeed, unlike Boris Karloff (who played bit parts before coming to fame as the Creature in Frankenstein) and Bela Lugosi (whose first film role was as Dracula in the film of the same name), Vincent Price already had a well established film career as an actor before he began starring in horror movies with any regularity. Indeed, Mr Price's first film was Service DeLuxe in 1938. By 1940 he had only starred in three horror movies, and two of those were only borderline horror movies at best (more on that later). Afterwards he would not appear in another horror movie until House of Wax in 1953 (although he did provide the voice of the Invisible Man in the horror comedy Abbott and Costello Meet Frankenstein). The fact is that Vincent Price had a career and a life that went well beyond horror movies. Vincent Price was born to wealth in St. Louis, Missouri on May 27, 1911. His father, Vincent Price Sr., was president of the National Candy Company, which produced everything from jawbreakers to jelly beans. His grandfather, Vincent Clarence Price, had created the family fortune when he invented Dr. Price's Baking Powder, the world's first cream of tartar baking powder. As a scion of wealth, young Vincent attended the exclusive St. Louis Country Day School. He attended Yale, where he majored in art history. During the summers Mr. Price would travel through Europe. It was while in college that Vincent Price took an interest in drama. Unfortunately, his lack of experience made it difficult for him to get roles in the New York theatre community. His solution was simply to go to England, where he exaggerated his resume and as a result received his first professional acting job. It was only a few months after moving to England, in 1933, that Mr. Price was cast as Prince Albert in Victoria Regina at the Gale Theatre. It was in 1935 that Victoria Regina would make its debut on Broadway, with Vincent Price once more playing Prince Albert. He would appear on Broadway in four more plays over the next three years: The Lady Has a Heart (1937), The Shoemaker's Holiday (1938), Heartbreak House (1938), and Outward Bound (1938). Such success on stage would naturally lead to a film career. He signed a contract with Universal Pictures, and made his debut in Service De Luxe opposite Constance Bennett in 1938. While Universal Pictures was then best known for its horror movies and Vincent Price would one day become identified with the genre, in the late Thirties and early Forties Mr. Price may have been best known for costume dramas and period pieces. At Universal he played Sir Walter Raleigh in The Private Lives of Elizabeth and Essex (1938). At Fox he played King Charles II in Hudson's Bay (1941) and the Marquis de Fleury in A Royal Scandal (1945). While Vincent Price would appear in several costume dramas and period pieces in the late Thirties and the Forties, it would be during this period that he would first appear in horror movies. That having been said, of the three movies he made prior to 1940 that are often considered horror, at least two of them are as much period pieces as they are horror movies. Often considered the first horror movie to feature Vincent Price, Tower of London (1939) centred on the rise of King Richard III to the throne of England and featured Mr. Price as the Duke of Clarence. While often counted as a horror movie, it should perhaps best be considered a costume drama with elements of horror. Mr. Price's next film would be a straight forward horror movie. The Invisible Man Returns (1939) was the sequel to the highly successful The Invisible Man (1933) and starred Mr. Price as the tragic Sir Geoffrey Radcliffe, who uses the invisibility formula to clear himself of a murder charge. The third movie Mr. Price made before 1940 which is often considered horror is The House of the Seven Gables (1940), loosely based on Nathaniel Hawthorne's classic horror novel. While Mr. Hawthorne's novel is considered a classic of the genre, however, the movie version is more a period piece with elements of horror. In the film Mr. Price played the tragic Clifford Pyncheon, the innocent victim of older brother Jaffrey Pyncheon's schemes. Tower of London, The Invisible Man Returns, and The House of the Seven Gable would be the last horror movies in which Vincent Price appeared until Abbott and Costello Meet Frankenstein in 1948. After Abbott and Costello Meet Frankenstein, he would not make another horror movie until House of Wax. Indeed, while the casual film viewer might identify Vincent Price with horror movies, film buffs know that he appeared in some major films throughout the Forties that were decidedly not horror movies. In 1940 he appeared in the adventure film Green Hell. In 1944 he played Shelby Carpenter in Otto Preminger's classic Laura. He also appeared in Dragonwyck (1946), yet another period piece, as the object of Miranda Wells' (Gene Tierney) affection, distant cousin Nicholas Van Ryn. 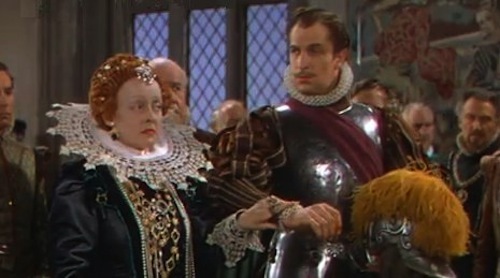 In 1948 Vincent Price played Cardinal Richlieu in The Three Musketeers. Even after his return to horror in House of Wax in 1953, Mr. Price would continue to appear in non-horror roles. He played Omar Khayyam in Son of Sinbad (1955) and the villainous master builder Baka in The Ten Commandments (1956). As stated before, it was in 1953 that Mr. Price returned to the horror genre in House of Wax. In the film he played Henry Jarrod, a sculptor of wax figures with a desire for revenge. 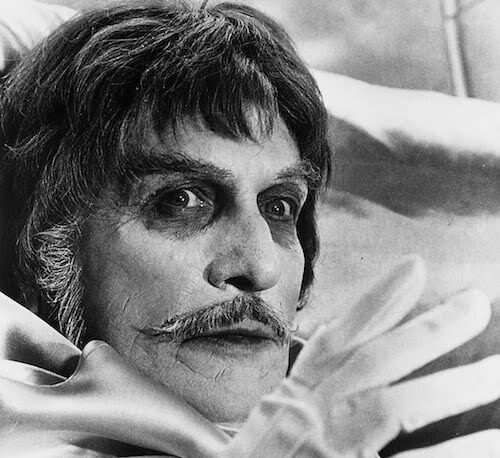 Even after the success of House of Wax, Vincent Price's career would not consist primarily of horror movies, even though he would star in The Mad Magician the following year. It would not be until the hit film and horror classic The Fly in 1958 that Vincent Price's career would turn increasingly to horror movies. Following The Fly, Mr. Price would appear in the William Castle films The House on Haunted Hill (1958) and The Tingler (1959). In 1960 he would appear in the first of a series of Edgar Allan Poe adaptations he made with Roger Corman, The House of Usher. By the mid-Sixties, with but few exceptions, Vincent Price's film career consisted almost solely of horror movies, including such classics as The Comedy of Terrors (1964, also starring Boris Karloff, Peter Lorre, and Basil Rathbone), Witchfinder General (1968), and The Abominable Dr. Phibes (1970). He would become the actor most identified with the genre aside from the legendary Boris Karloff and Bela Lugosi. Even as Vincent Price became the horror movie star of the Sixties and Seventies, his life still consisted of things which had nothing to do with the horror genre. In 1968 he appeared on Broadway again in Dating the Day. In 1978 he played Oscar Wilde on Broadway in Diversions and Delights. 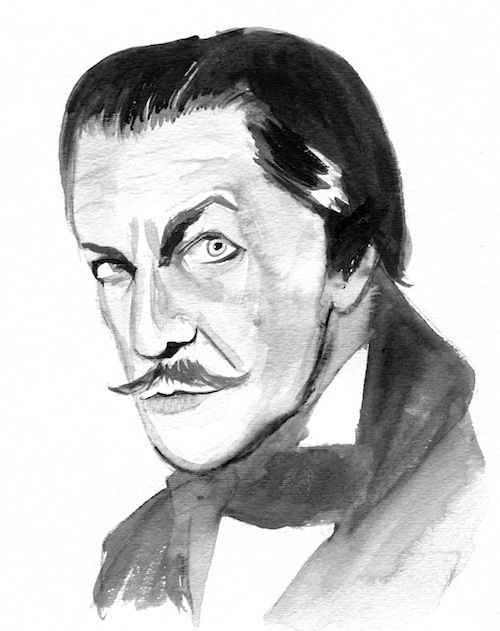 Having majored in art in college, Vincent Price remained devoted to fine art throughout his life. He was a member of the Cortauld Institute in London, England, dedicated to the study of art history. He was also known as an art collector, and in 1951 he started donating fine art to East Los Angeles College. By 1957 the Vincent and Mary Price Art Gallery would be founded at the college. It would evolve into the Vincent Price Art Museum, which still exists to this day. It is also important to remember that Vincent Price remained dedicated to the craft of acting and, with regards to this, he never forgot his home state of Missouri. Later in his life he maintained close ties with Northeast Missouri State University (now Truman State University). It was around 1960 that Mr. Price would make his first appearance at NMSU, appearing nearly every year at the university for nearly thirty years. He would even teach workshops on both acting and art history at the university. In 1984 Mr. Price established the Vincent Price Theatrical Performance scholarship at the university, awarded to those who have demonstrated talent in acting. Although best known as an actor in horror movies, then, Vincent Price had a career and a life that extended well beyond the genre. Indeed, much like Boris Karloff, in real life he was very different from his on screen persona. From every account I have read of Mr. Price, he was a professional and a true gentleman. Indeed, from frist hand account of friends who were lucky enough to meet the great Mr. Price at NMSU, not only was he a total gentleman, but he took a genuine interest in his fans, not only signing autographs but talking to them. I had a friend who had her copy of Alice Cooper's album Welcome to My Nightmare autographed by him, on which he provided narration for the song "The Black Widow." Not only did he autograph the album for her, but he told her of his memories of working with Alice and even recited the narration from the song from memory. Vincent Price was not simply a horror movie actor. He was a talented actor who appeared on Broadway and in a number of classic films outside the horror genre. He was also an art expert and collector who dedicated much of his life to educating the public in art, and he was also devoted to education through his support of NMSU. What is more, he was a true gentleman, who genuinely cared about people. It's not that they don't simply make actors like Vincent Price any more. They don't make men like him anymore. Kate: AMAZING ART! Wow. Just wow. Terry: I LOVE THIS POST SO MUCH. Vincent Price was utter brilliance and complete awesomeness. Great post! Thanks for the kind comments, Millie! And thank you, Kate, for letting me write this guest post! Vincent Price was da man! As Mercurie so adeptly demonstates in this awesome overview of his career. I didn't know the bit about him exaggerating his resume and going to England. Ha! That's very clever. I'm not much of a Horror flick kind of gal so I really love Vincent Price's earlier non-Horror work. Kate - Superb job on the portrait. You got those eyebrows dead on. Vincent Price is amazing, and this post does him justice. He was an amazing actor and had a killer voice. There are not many people that know that besides lending his voice to Thriller he also lent it to Alice Cooper's Black Widow. It's so chilling, nothing less is expected though!